MIHA is made up of 20 Districts. 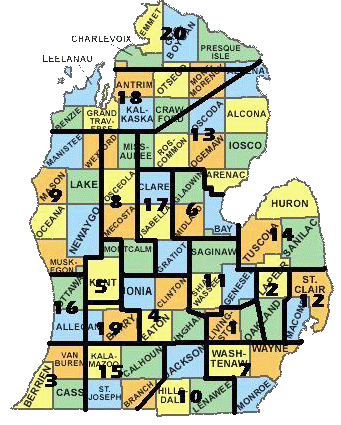 Each District holds their own individual competitions. In the High School season, the top 2 teams in each Division from each District move on to one of five Regional Competitions. This is a map of the general District lines for MIHA. There are many instances where teams are in different districts than these boundaries on the map. If you are unsure of which District our team is in see below for a full team list to see if your school has a team and which District your school is a member of. If you are unsure, starting a new team, or just have general inquires about the District lines, please email the Executive Board. For more information about starting a new team, click here.